Lake monsters saturate our society. It seems like any lake you visit will have some sort of strange beast living beneath its surface. What are these creatures? What environment is best suited for them to live? Why are there so many? Lake monsters can be anything from a large snake to a prehistoric creature. Jamie Hall, the creator of the website The Cryptid Zoo, tells us in his article about lake monsters that they were once generally believed to be plesiosaurs. Now, he tells us, they are believed to be zeuglodons, a primitive whale that can easily live in cold waters. The shift in opinion happened because most lake monsters are found in northern waters that would be too cold for the reptilian plesiosaurs (“The Cryptid Zoo: Lake Monsters”). Because of the variation in the descriptions of lake monsters, there is a wide variety of creatures that could be in the lakes. The most well-known lake monster is Nessie, the Loch Ness Monster. Nessie has been around for decades. In the Monsters of the Loch Ness Roy Mackal provides a table of recorded Nessie sightings in the index. The earliest sighting was in 565 A.D. (225) showing that the legend has been around for centuries. 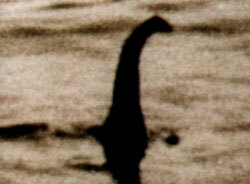 Out of all the sightings of Nessie, there is no agreement on what the monster looks like. In the appendix of the Monsters of the Loch Ness there is a table of monster sightings. In two of the 251 water sightings, Nessie appeared to have some sort of limbs; in most of the land sightings, Nessie had at least two flippers (225-264). The number of appendages, whether there are two or four, is varied in the sightings. The Legend of Nessie, the official site for the Loch Ness Monster, tells us that in 20 % of the sightings Nessie’s back had distinct humps (Legend). The humps can be considered a common trait because of the percentage of sightings in which humps were sighted. Mackal believes the humps can be explained by a possible dorsal fin folding over when the creature surfaces. If Nessie were a large eel, then the eel’s horizontal and vertical swimming motion could also cause the multiple humps (150-155). This is a probable explanation but does not account for the descriptions of her having limbs. On the home page of www.nessie.co.uk there is a list of facts about the loch ness. The lake is about twenty two and a half miles long, between one to one and a half miles wide and 754 feet deep. The site describes the lake floor as being “as flat as a bowling green” (Legend). The lake is large enough for a creature of Nessie’s size to live without being detected. Fourteen Pictures Library via PBS.org. This iconic photo has been subject to much controversy and debate. In Lake Murray in South Carolina there are reports of a monster living beneath the surface. Lake murray is a manmade lake close to Irmo. The lake has now become popular for recreational activities, and a large number of those activities revolve around boating. Lakemurraymonster.com is a single page website that provides information about this mysterious creature known as Messie. The monster was first spotted in 1933 near Irmo, SC. The monster is believed to be an aggressive cousin of the Loch Ness Monster. It has been described as a prehistoric serpent (The Lake Murray Monster). When I was younger, my family would go on day trips to the lake, and we would spend the entire day boating and swimming. As a child, I was worried that I would be attacked by a water mocasin, a venomous water snake, or by a large snapping turtle. If I had been told about Messie, I would never have gotten near a lake again. The thought of a giant, aggressive monster is enough to give anyone the chills. According to lakemurraymonster.com, the Gilbert Little sighting in 1933 was the first time the monster was seen. The most recent sighting was September 15, 2002 by Mrs. Sandie Hurst. She saw a ripple which bore a remarkable resemblance to a picture on the website (The Lake Murray Monster). The ripples she saw could have been Messie, but it also could have been something else like an animal, a log, or a wave. There is no way to be certain of what Mrs. Hurst because we weren’t there. Do these creatures really exist? In order to prove beyond a shadow of doubt lake monsters exist, the lakes they live in would have to be drained. This process would destroy the ecosystems of hundreds of animals and kill the monsters in the process. Until a better solution is found, it is up to you to decide if our world is inhabited by large lake dwelling monster like Messie and Nessie. Hall, Jamie “The Cryptid Zoo: Lake Monsters” The Cryptid Zoo. n.p. 2005. Web. 17 Oct. 2012. The Lake Murray Monster. n.p., n.d.Web. 17 Oct. 2012. The Legend of Nessie the Ultimate Loch Ness Monster Site. n.p., 2012.Web. 17 Oct. 2012. Mackal, Roy P. The Monsters of Loch Ness. Chicago: Swallow, 1976. Print. Wilson, R. Kenneth. The Surgeon’s Photo. 1 April 1934. Daily Mail: London. pbs.org. Web. 22 October 2012. The article gives a brief history of the Loch Ness legend, a summary of searches for the monster, and an explanation of the “Surgeon’s Photo” hoax. The article on Nessie provides more detailed information on the legend such as different hoaxes, modern sightings, and non-animal explanations. The blog discusses the Lake Murray Monster skeptically, and the author claims South Carolina made up the legend.